On UpTick you are trading with a multiplier (=on margin), which allows you to multiply your potential returns but also losses. 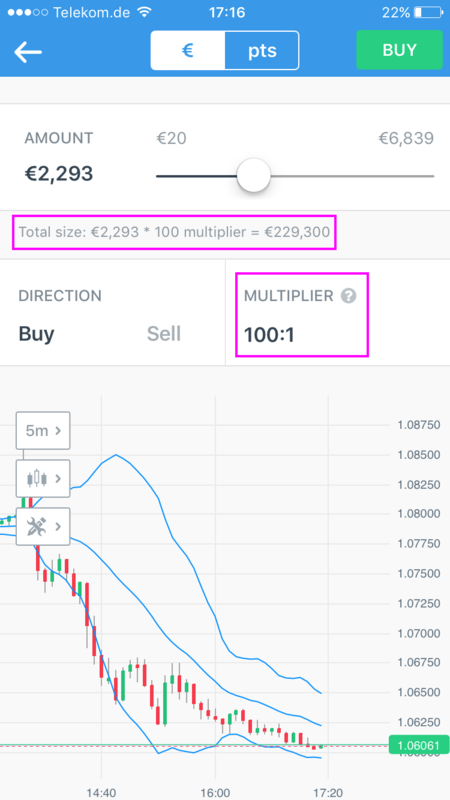 Let&apos;s say you open a trade with €1,000 trade size and a 20:1 multiplier. This then means that every 1% move in the market, moves your position by 20%. What happens effectively is that you are trading with 20 x €1,000 = €20,000 instead of the €1,000 you have deposited. This is called trading on margin. There is of course risk associated with trading on margin. When the market moves against you, your losses are also amplified and may even exceed the amount of capital you invested. For example: a 6% move with a 20:1 multiplier will result in a loss of 120%. When this happens very suddenly or overnight (e.g. when earnings are released for stocks after the market closes), then we might not be able to close your position at -100% and you could lose more than you invested.